Every year, on the first day of summer, Lilly Pulitzer has National Wear Your Lilly Day (yes, its a real thing!). Since we just love Lilly so much around here, Ella has a whole week of wearing her Lilly! Ok, so...Ella is out of preschool for the summer and is starting to get bored. And I have an attic full of teaching supplies that I never use (but I refuse to get rid of in case I ever go back to the classroom!). I decided to do some thematic art and educational stuff with Ella each morning during Lucas's morning nap (because yes we are still stuck in nap jail! Ugh! When will it end?!?!). Since this first week fell during National Wear Your Lilly Day (or week in our case! 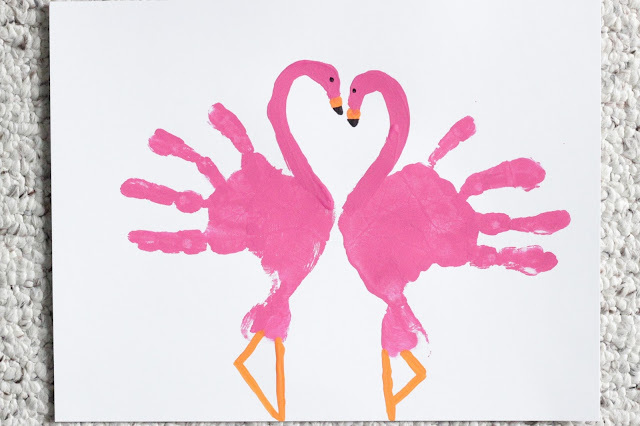 ), I thought we would do some Lilly Pulitzer-themed activities, with lots of flamingos and palm trees! 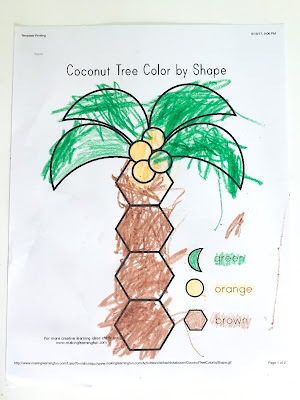 I wanted to share with you all in case anyone else out there is stuck in nap jail and/or looking for some fun, easy things to do with your preschooler this summer! 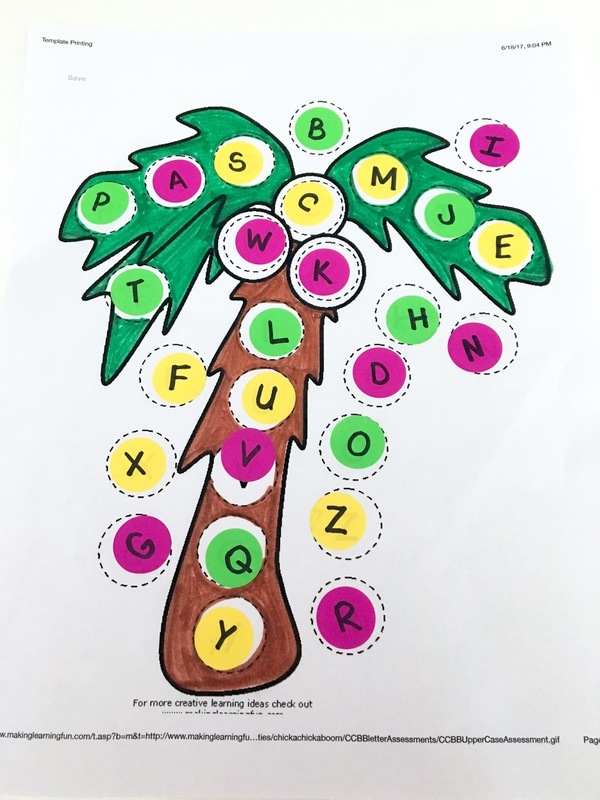 After reading Chicka Chicka Boom Boom, we did a little palm tree letter matching. You can find the printable here. This can be adapted so many ways. I chose to write the same capital letters on the dot stickers, but you could also write lowercase letters, or if you're really artistic, a picture of something that begins with each letter. 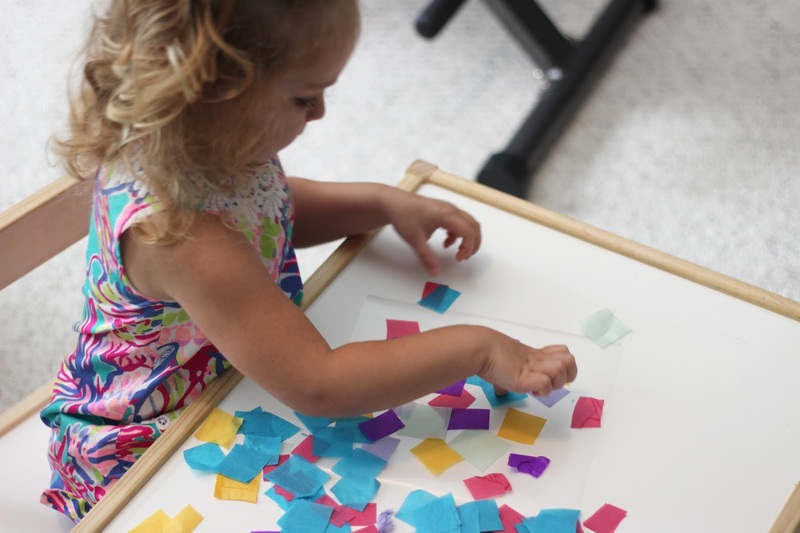 You can also skip the dot stickers altogether and have your child use a dot marker to cover the letters as you call them out. 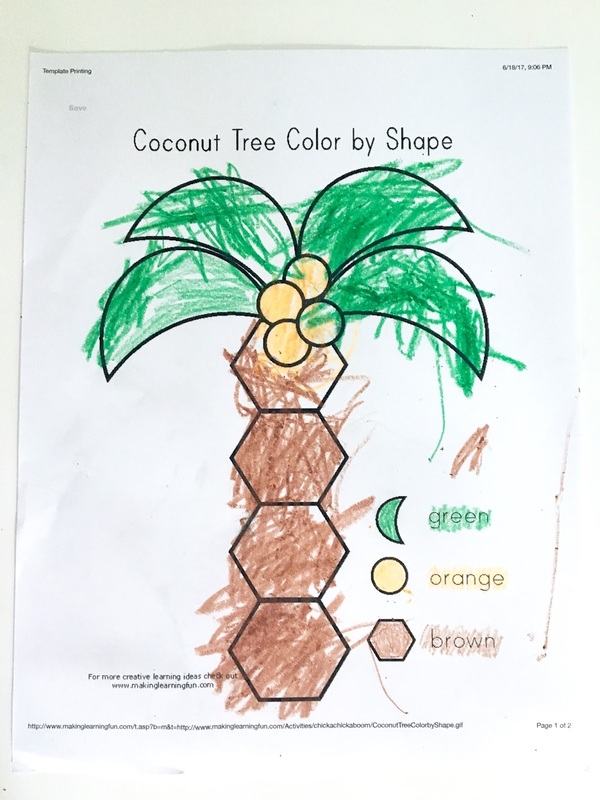 We also did this shape coloring page. Moving on to art projects! First, we made a handprint flamingo! We also made flamingos out of paper plates and popsicle sticks! 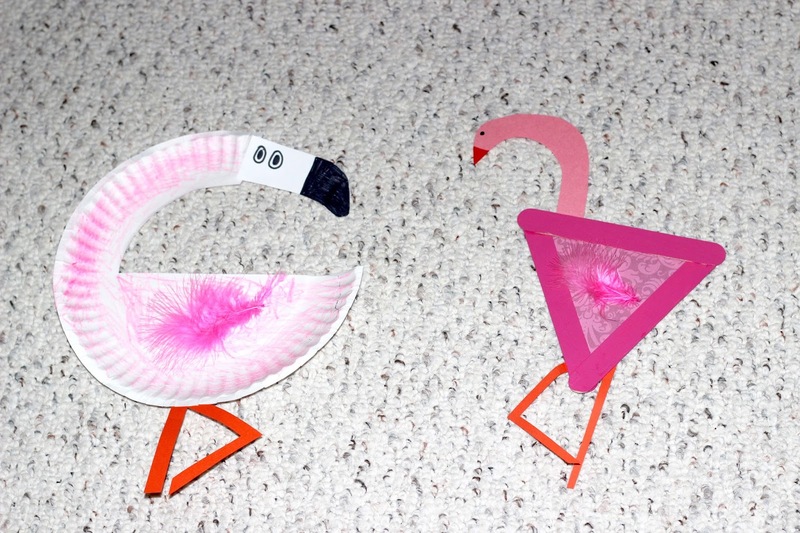 Last but not least, I had this grandiose idea to make a flamingo sun catcher. We used to make sun catchers for all of our different themes/seasons when I taught kindergarten and it is such an easy, yet time-consuming activity! First, cut a large piece of clear contact paper and peel off the back. 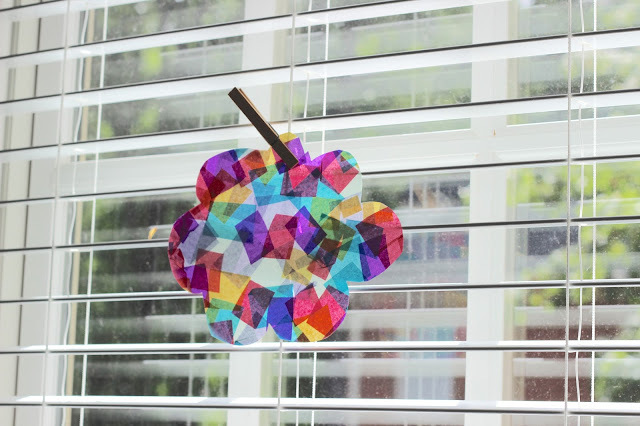 Put down already-cut squares of different colored tissue paper until you have covered the entire piece of contact paper. You can also spray it with water at this point to get the colors to run a little bit, but I opted not to do that this time. Then, put another piece of clear contact paper on top and cut out whatever shape you want. This is when I realized there was no way in hell I would be able to cut out a freaking flamingo. Ha! So we made a flower instead! 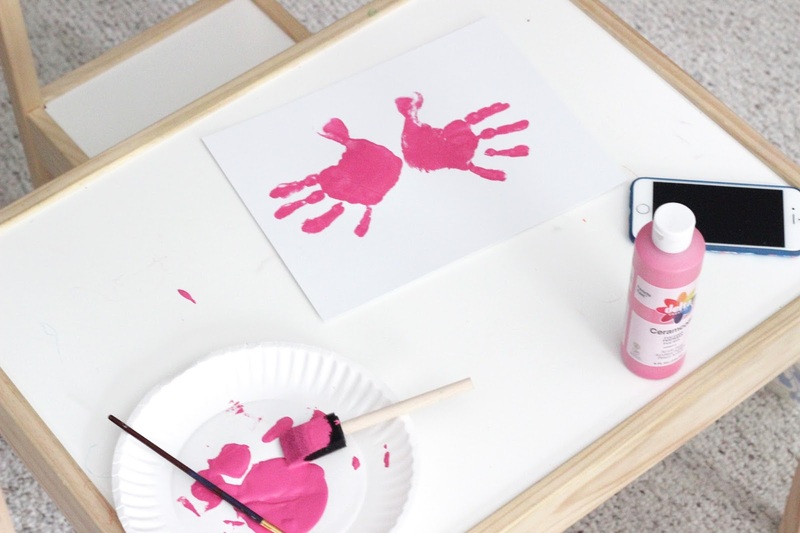 For sensory play (and something Lucas could do, too! 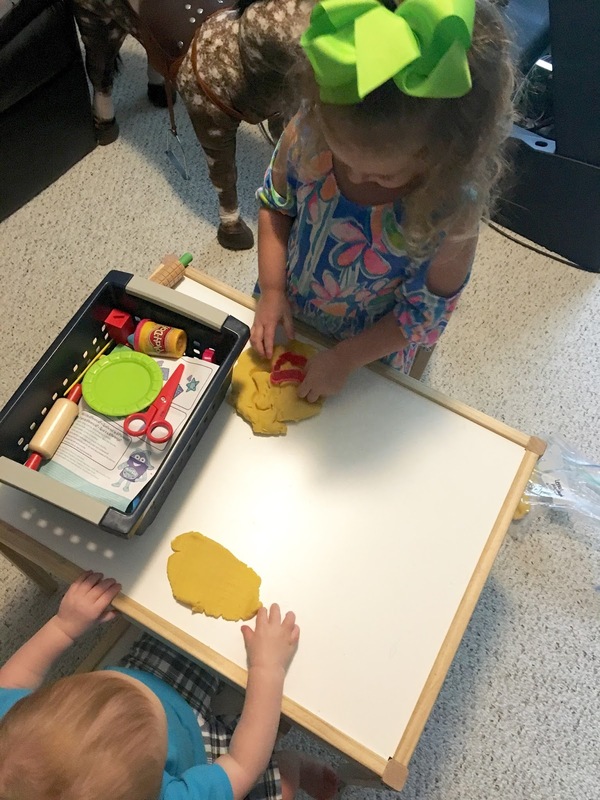 ), I made lemon-scented play dough, following this recipe. I just added some lemon extract right before the kneading stage. I really love making play dough vs. buying it because I like the texture of it better, I don't worry as much if Lucas eats a little bit (not like that happens...) and it's super cheap so I can just throw it away after a few months without feeling guilty! 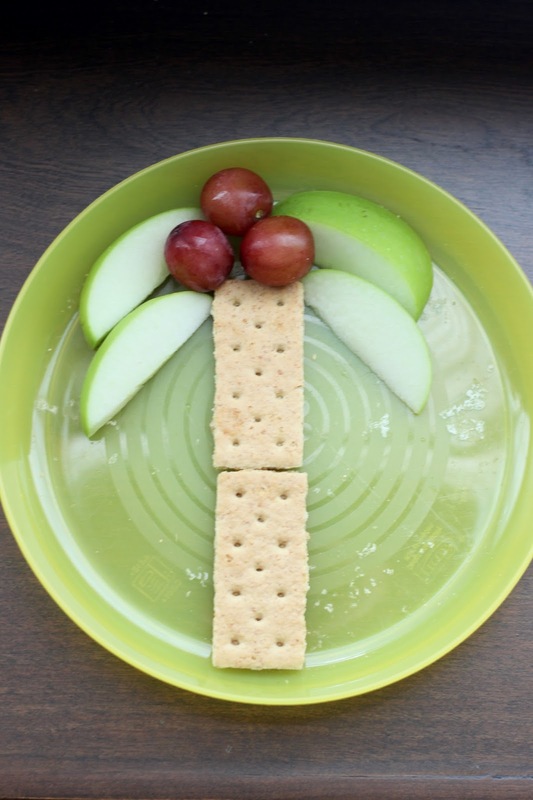 And last but not least, we had to have some sort of fun snack! 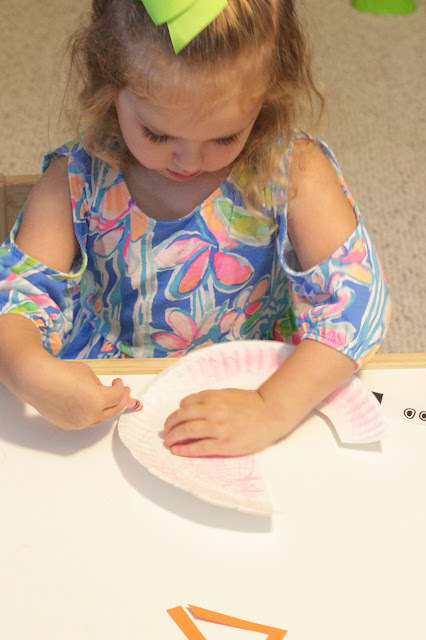 Ella really enjoyed our "Lilly Pulitzer" activities, so I decided to plan some more thematic weeks! I just can't help myself. I'll try to share each of our fun weeks' activities with you throughout the summer. I am probably a big loser for planning all of this out...and watch, Lucas drops his morning nap next week and we don't end up doing any of this fun stuff! We shall see...! Ok overachiever!!!! So awesome though! And you know I love those Lilly crafts!